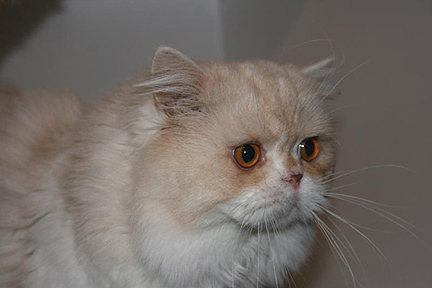 Teddy is a cream cameo tabby and white long-hair, straight-ear boy. He is a cuddly, friendly boy who loves to run and jump. He is extremely affectionate, and will jump in our laps whenever he can. His favourite toy is the laserlight. This pretty girl has straight ears and long hair. 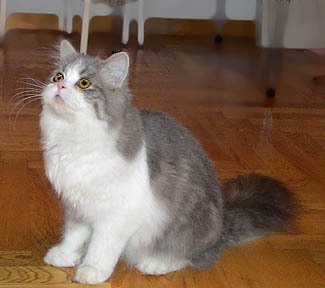 She has large round eyes that start intently at you, and a soft coat that is easy to care for. She is a bouncy little girl who gets long with everyone. She loves to play with the tinsel wand, and gets great delight from jumping on her brother and the other kittens. 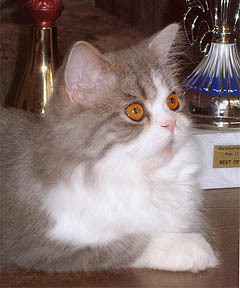 Maxin now lives in Russia at Marmorensy Cattery.